Singzu Joint's debut EP Making Love In Imphal was the accidental product of a bunch of experiments conducted by producer, guitarist, and vocalist Laishram Eroz Khumancha, during his time studying sound engineering techniques and tools under Bangalore based musician and producer Jeet Singh. "I was studying sound engineering under him in his studio," Laishram says, "I used to mess around with stuff, with Cubase and DAWs, and accidentally enough, our first song, 'Making Love In Imphal', was born - the music. So, I decided to send the files to my friend Rajiv Nongmeikapam [guitarist], and Riki Chingangbam - who is our vocalist. I asked them what they thought about the music, and they were really interested." The passing around of music files quickly turned into a project with a definitive objective, and work on the initial music began with laying down guitars and vocals, creating the band's first song and soon to be the title track of their debut EP. The name ‘Singzu Joint’, as Laishram tells us, comes from a local dish called Singzu - a mixture of different spices and vegetables - allegoric to the kind of music the band writes. "We use the 'Singzu' to signify the mixture;” he says, “So, Singzu Joint is basically a mixture of genres in music including whatever we like, like folk, electronica, and whatever that comes to our mind." Not unlike most other bands resident to the North East, Singzu Joint centre their music around socio-political issues. "The EP Making Love In Imphal is about life in Imphal and Manipur;" Laishram says, "What the social and political situation is like, but we wanted to put a twist to it by introducing the love angle also. How we try to forget each and every difficulty we faced out there through love. It is basically about how people need freedom, not like freedom from India or anyone, but personal freedom." Laishram iterates Singzu Joint's music to be a form of self expression toward their conflict ridden life, he says: "We have the AFSPA and the armies everywhere," Laishram says, "And these things are making wars everywhere. So, we wanted to tell people enough is enough, and we have life, and we need to move on, with love. Our idea of freedom is personal freedom and not the sovereignty of the state or country, we don't believe in boundaries." The Bacardi NH7 Weekender hit Greater Noida again this year for the NCR edition of the festival. Meshuggah, Nucleya, Mutemath, Scribe, And So I Watch You From Afar, the lineup had it all. The festival also had hot air balloons, gallons of alcohol, a Ferris Wheel, and so much more. Akhil Sood with the full report. Click here for stray observations from the festival. Karan Kumar, the bass player of Mumbai/Pune's post-rock outfit A Mutual Question, interviews Rory Friers, the guitar player of And So I Watch You From Afar, the four-piece instrumental band from Northern Ireland. Aditya Varma interviews Warren Mendonsa, the brains (and pretty much everything else) behind Blackstratblues, and the guitar player for seminal act Zero. A review of Foreward by Big City Harmonics. Delhi's Barefaced Liar have made a name for themselves with their indelibly catchy modern-rock vibe, keenly intertwined with a degree of virtuosity. The band is currently in the process of working towards releasing their second album in the next couple of months, while also gigging heavily. We chat with them about the new album, opening for Hoobastank, what the future holds, and their songwriting process, among other things. Naturally, a three-day music festival will have a lot of things happening, not all of which can be crammed into a review. So we thought we'd have this special section for stray observations made at the Pune edition of the Bacardi NH7 Weekender festival, held on Oct 18-20. Read on for Scribe vs. a heckler, the perils of drinking buckets, the Red Bull Tour Bus, dogs, sugar rushes, and more. Click here to read our complete review of the festival. Vasuda Sharma’s debut record, Attuned Spirits, is an amalgamation of western and traditional Indian classical sounds, with an underlying aesthetic of exploration and experimentation that lends it a clear direction. Collaborations feature heavily on the album, yet the continuity of her vision springs forth at every juncture. Vishad Sharma speaks to her about writing for the album, setting up a live band, and her journey of self-discovery and new beginnings. Invigorate Seed is an exciting young band from Jorhat, Assam that writes progressive/metalcore music packed to the brim with a thundering intensity. Oh, and they're all still teenagers. They have released their first official single, titled 'Vanity', with RSJ. Learn more about them below. A review of Lucky 7: Stupid Ditties, an Ennui.Bomb Compilation. A review of Reverrse Polarity's self-titled debut. Inch by inch, Frame/Frame has been making waves within the indie community with his bouncy live act and the release of his new EP, Swimmers, accompanied by a music video for 'Pastels'. Here, he talks to Shomi Gupta about the album, the video, playing live "bangers", and recording the flush in his toilet, of course. Them Clones have released two new singles, 'Mediocre' and 'Speak When I'm Gone'. The band is trying to reinvent its sound, and we speak to them about introducing a new member into the mix, about the idea behind releasing singles and not EPs, and what directions they're keen on heading in. A review of Ambiance de Danse by Amyt Datta. A review of Indulge.Divulge by FuzzCulture. 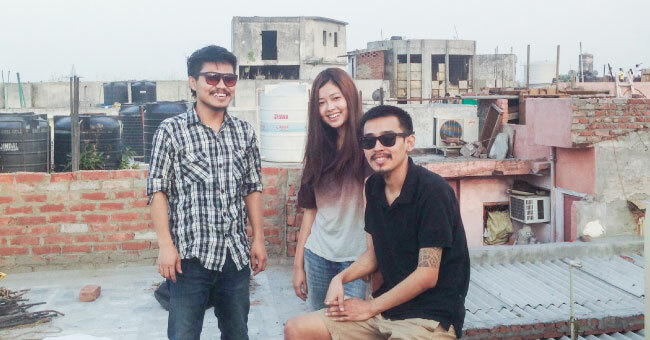 Don Bhat Passenger Revelator are gearing up for an album. Akhil Sood turns all good Samaritan and stuff and suggests five alternative career options for Priyanka Chopra to pursue after hearing her song 'In My City' featuring Will.I.Am. Akhil Sood dons his viewing goggles and his top hat and pops a batch of corn before sitting down to critically dissect the new Ska Vengers video. You do have the option of skipping his thoughts and viewing the video at the bottom of the page. Don't tell us we didn't warn you. We round up our Heavy Metal Dictionary for Noobs with a full-roundup of the basics. This is it. You know this and you might not have to prove your mettle in the moshpit! Part II of our metal dictionary takes you from K all the way to T. From trivia to fun facts to significant historical information to the ins and outs of metal in general, we have everything in this three part series. View part I here.